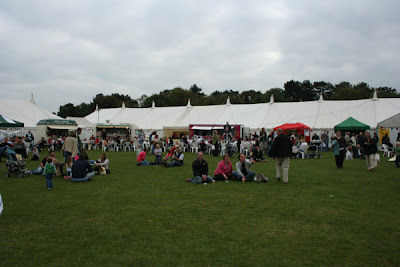 Stone Food and Drinks Festival. a Very Merry Christmas and All the Very Best For 2008. We will see you on the cut in 2008 no doubt. 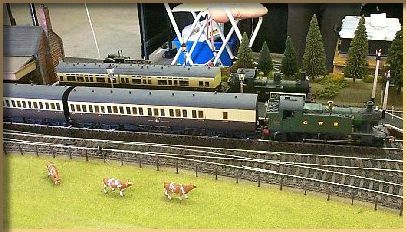 Due to a very busy time with the engine we have not had anytime to post, so I have added all the updates in one post. 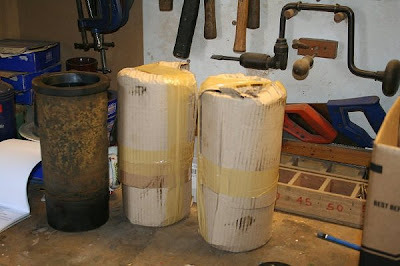 The new oil rings arrived so it was hoped that Keith and Roger could restart rebuilding the engine. 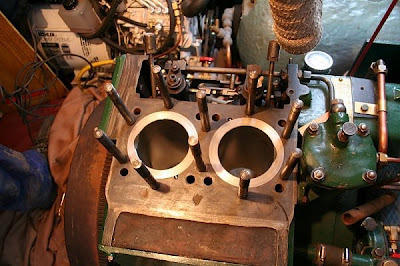 They refitted the pistons with the new oil rings. 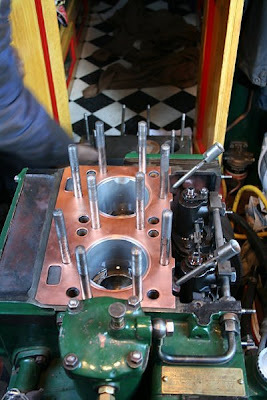 Then one of the 2 new head gaskets was put in place and then the refurbished head was refitted. The head was torqued down ready for the fitting of the rockers etc. to the head. With an early start they soon had all the rockers, injectors, oil pipes etc. fitted to the head. 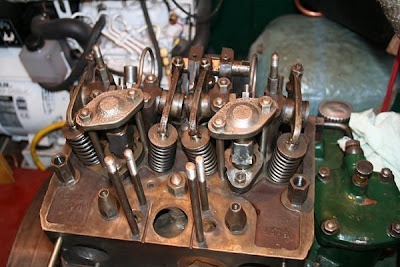 Then the tappets were adjusted. It was now a matter of attaching all the water cooling and exhaust. But as they now knew this engine inside out and back to front they soon had that sorted. Just the Exhaust Needs to be Fitted. Then before adding any water they went for a dry run. They turned the engine over by hand with no compression to pump fuel up to the injectors and to start circulating oil around the engine. Once they were both satisfied with this, the compression was turned on and the starter motor engaged. She fired up 1st time, it was a glorious sound. The 1st Puff of Smoke. They ran her for a short time only just to check that everything was functioning ok. The exhaust was very clean after the initial blast out of all the residue oil etc. from within the cylinders. The engine was running as sweet as a bird, with a constant note from both cylinders, unlike prior to the rebuild where one cylinder sounded a bit soft. Roger asked Keith to check the oil pressure at the gauge on the roof, he looked and the needle was resoundly on the zero! 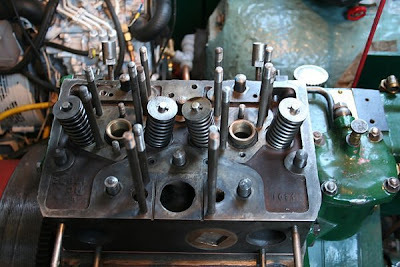 But on a second closer look it was actually the wrong side of the stop, it had gone right round the gauge, as the oil pressure was higher than before, and we fitted a new gauge, in fact the original one that was mounted on the engine, which had a higher range, which cured that problem. Roger was very pleased with the result as this is the 1st time he has carried out such a major rebuild on a customers engine. They then filled the engine with water to test the water pump, but alas this still leaks, and the head leaks still. 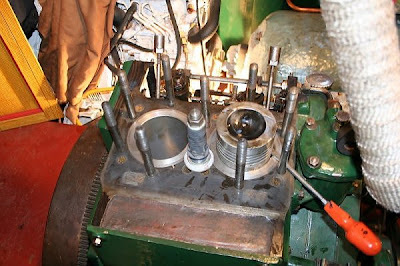 On the 12th December they intended to run the engine up to operating temperature and then let it cool down to retorque the head. However as the head was still leaking quite badly they decided to take the head off again to check everything. Good thing they did too, as they discovered that the head gasket for some reason had ripples in it, indicating that it wasn't tightening down properly, but as this was late in the day they decided to leave it overnight and mull over it. It was now the 13th December and Roger was looking rather pleased with himself, he had solved the problem. It was obviously really when you weigh up all the facts. 2 of the studs had pulled out when they undid all the head nuts, these 2 studs had captive nuts on, and they were the only ones. The ripples in the head gasket were between these 2 studs. Any clues yet? Well remember that they have had the head skimmed, and no doubt it has been skimmed before, reducing the height of the head, have you solved it yet? Well the captive nuts were bottoming out on the studs and not tightening down onto the head. Obvious when you look at the wider picture. So they took a couple of mm off the top of the 2 studs, and bingo problem solved, the head tightens down properly now. Keith would then be left to run the engine up to temperature and let it cool down before retorquing. On the 14th Dec we were off to see the pantomine Cinderella in Stoke-on-Trent. 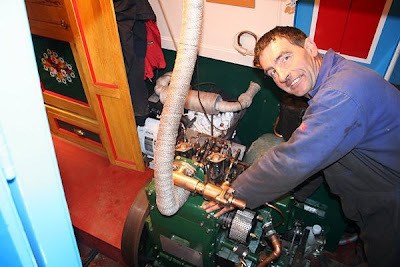 Today 20th December we gave up on trying to repair the water pump on the engine. 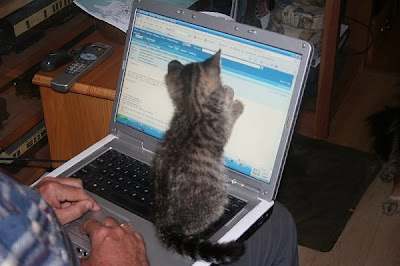 Both Roger and Keith have been working on it most of this week trying to stop it leaking without much success. They decided today that apart from totally replacing all the part of the pump they will never get it to stop leaking. So they decided to abandon it and to fit a Jabsco pump driven from the crankshaft of the engine. Keith refitted the original pump casing, minus the internals, for aesthetic reasons with the water inlet/outlets blocked off. We will have to wait until after Xmas now before obtaining the pump and the necessary pipework, so It looks like it definitely will be the new year before we can go for a test run. Both Roger and Keith have worked extremely hard on rebuilding our engine. Keith and I are so happy with how things have gone. We really appreciate the time and effort Roger has put into getting us up and running. 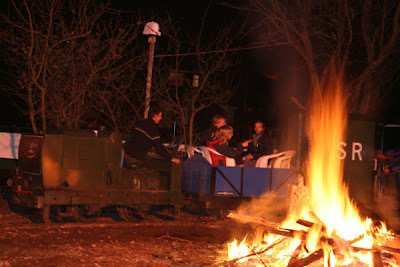 Hadar's engine now sounds fantastic, so we look forward to 2008 with renewed positivity. Thank You Roger and Tina for all you help. Well the overnight brain cells did the trick. Roger came up with a solution. 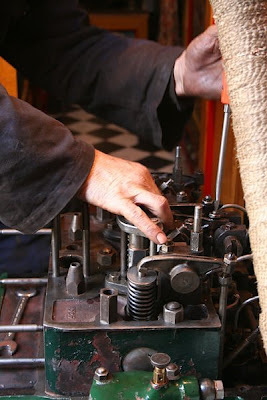 He used a section of tube, with a slot cut in it, and a groove at one end to take the piston rings in. 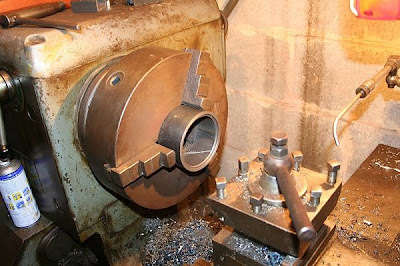 Once this is placed in the chuck of the lathe, as seen in the photo above, and the chuck is tightened up, this squeezes the tube enough to grip the piston ring whilst in a fully compressed state. 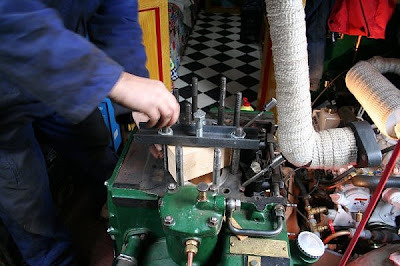 This then allowed the required thickness the be removed from the inner edge of the ring. Excellent. You can see the slot in the tube running diagonally across the lower side. 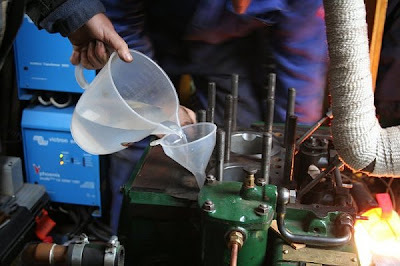 As of lunchtime today (I am typing this in as I eat, hahahaha) the 1st piston is fully installed with all the piston rings fitting inside the liners, and the big end connected. 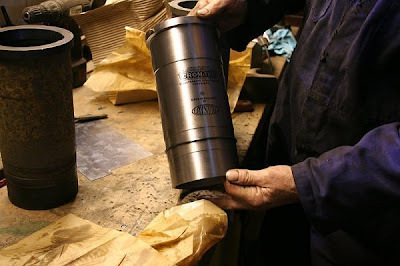 The 2nd piston is in place in the liner ready for the piston rings to be fitted. Unfortunately after lunch we discovered that the oil rings are not the right ones, so we have had to order some different ones, which should take about a week to arrive. Cleaning the Pistons before Installation. 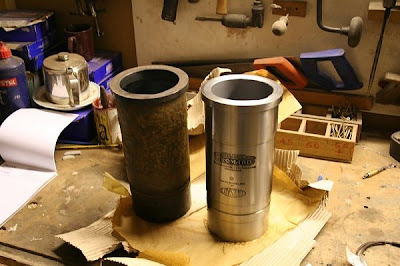 Having successfully installed the Liners yesterday, we set about installing the pistons. 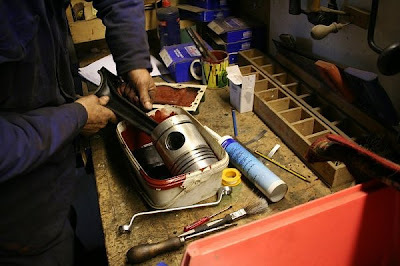 First the piston and con rod assembly was cleaned up very carefully. Then the lowest oil ring was fitted to the piston as once it is in the engine the piston will not come up high enough to fit this lower ring. 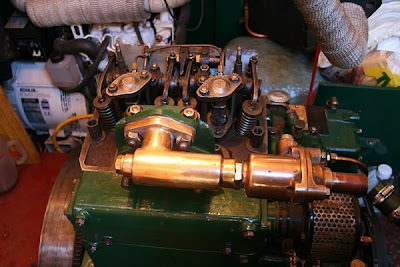 The piston and con rod were then installed into the engine. However things were going too well. We then fitted the remaining oil ring and 3 piston rings. 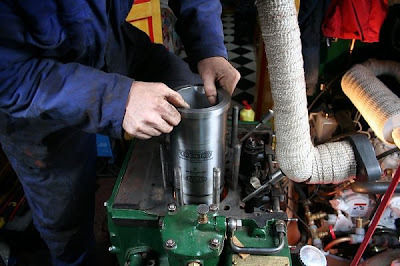 We worked the oil ring into the liner, but the 1st of the piston rings proved to be a tad difficult. We removed the rings and Roger checked their thickness, they were too thick! A quick phone call to the supplier and he said they were all he had. An overnight plan had to be formulated. 'O' Ring Fitted to Liner. 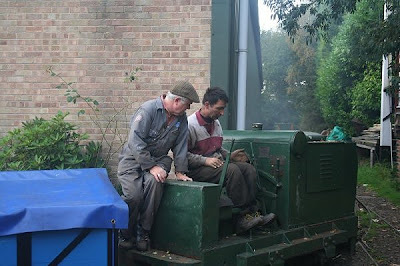 With the arrival of all the new parts last week, Roger and Keith set about fitting the new liners today. First they had to fit the 'O' rings to the liners. The 'O' ring creates the water seal at the bottom of the liner. Lowering the New Liner into Place. The liners were then lowered into the engine block. Tightening the Liner Down to Compress the 'O' Ring. Then the liners needed to be pushed down the final bit to compress the 'O' ring into the block. Roger made a device for this, which worked well. They then half filled the water jacket with water to check for leaks, so far so good. They will leave it overnight to make sure there is absolutely no trace of leakage. The 2 New Liners Fitted. The new liners for the engine have arrived, and very nice they look too. Roger has managed to obtain some 'O' rings to fit the new liners. These 'O' rings create the watertight seal between the water jacket and the oil sump, which is where the water was leaking and we decided to strip the engine down to discover there were no 'O' rings forming the seal, just some silicone sealant. One of the New Liners Next to an Old Liner. Yesterday the new piston rings arrived, so we now have everything ready to start rebuilding the engine next week. So we look forward to the rebuild of our engine and the prospect of cruising again. 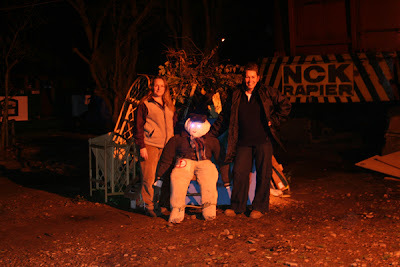 Having been given the pleasure of organising Bonfire Night. Tina and I decided what the bonfire needed was a nice looking guy. So we found some trousers, a shirt, a hat, scarf and a jacket and set about stuffing our guy with any rubbish to hand. 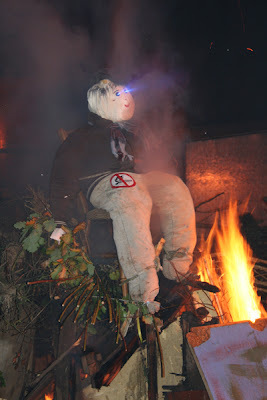 We recycled a chair that was destined for the bonfire anyway, and roped our guy to it. Poor thing he did look like he knew his destiny. But although I say it myself, I think Tina and I did an excellent job of the guy and getting the evening organised. 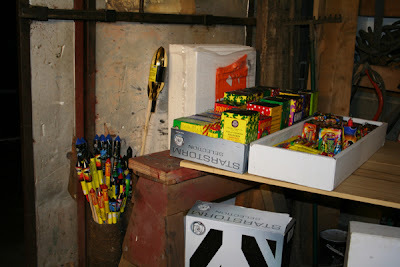 People coming to the bonfire do, contributed some fireworks for the display and as you can see we had more than enough for an excellent display. Tina and I had spent the early part of the day organising where everything was going to go, including the bar-b-que. 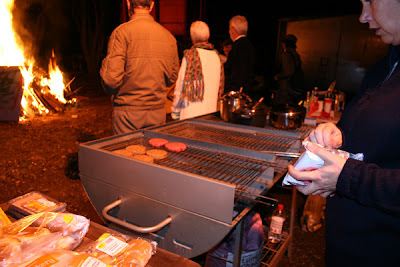 With people arriving at 7pm we made sure the bar-b-que was up and running for everyone to place their offering onto it. Friends bought burgers, sausages, a pot of soup, and a pot of chilli, plenty of bread rolls and of course plenty to drink. We had all three grills going, so there was plenty of room to lay out the food. No one went without throughout the evening, it was a huge success. Every guy knows his destiny, and our guy was no different, well unless you count his LED eye's which Roger's brother Martin fitted. Whilst he burnt everyone was taking bets on how long the eyes would keep going. if i recall they lasted 9 minutes from what we could see in between the smoke and fire from the bonfire. One very happy engine driver. Keith really enjoyed driving one of Roger's engines. 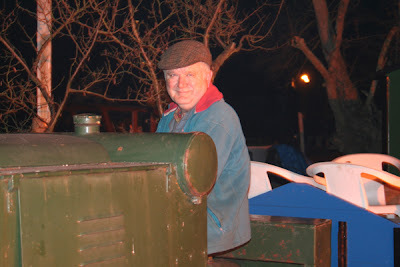 It has given him a lot of pleasure helping to restore the wagons and the adding new track. 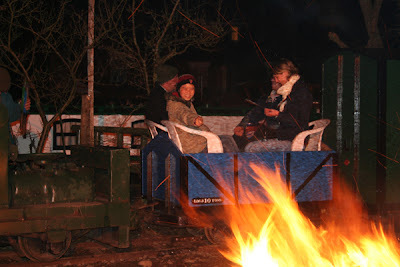 Everyone enjoyed a train ride around the boatyard. 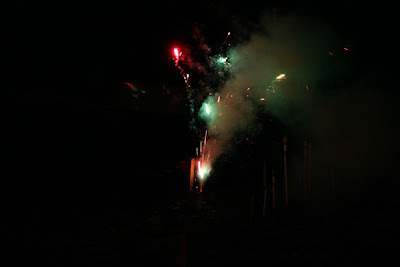 Keith, Roger and a few helpers gave us all a fantastic firework display. 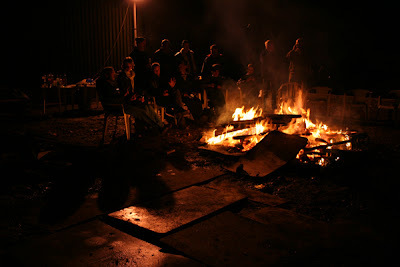 A wonderful evening was had by all those who attended, we finished up sitting around the fire chatting. No there was no singing, it would of probably put the fire out LOL. Well it has been a busy couple of weeks, too busy to even have time to update this blog. 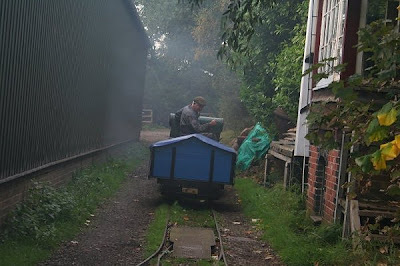 We are awaiting the return of the liners for our engine, so in the mean time Keith has been busy helping Roger with his railway as seen in the previous posting. 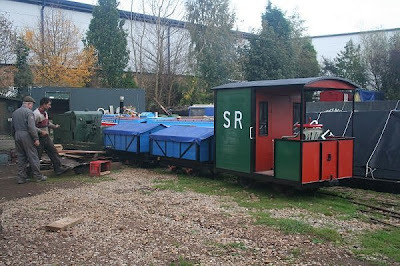 Once the brake van was completed they set about repairing the track and adding a new section which now allows 2 trains to be run at the same time. A small platform has been added between the new and old tracks. Which Tina and I helped with, moving soil about and we did a bit of landscaping, so it looks nice. I will take some photographs once it is all complete. Oakley arriving at the yard. 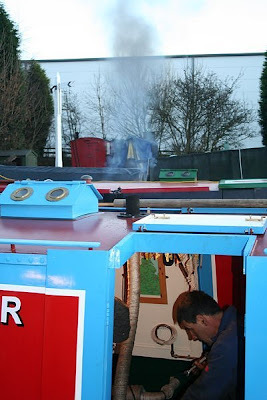 In between this work Keith has helped one of Roger's steel workers restore the narrowboat Oakley, a 1936 big Northwich of the G.U.C.C.Co. Whilst serving with BWB she was shortened to 60ft for use on maintenance work on the Leeds & Liverpool. He has a lot of work ahead but he has the skills and the facilities here. 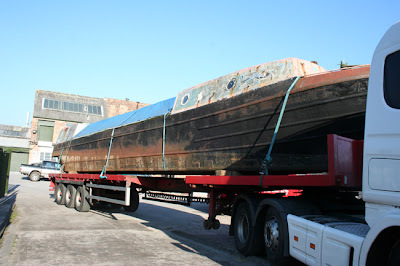 There is a website following this restoration at www.nboakley.blogspot.com so please go and have a look at Oakley's progress. 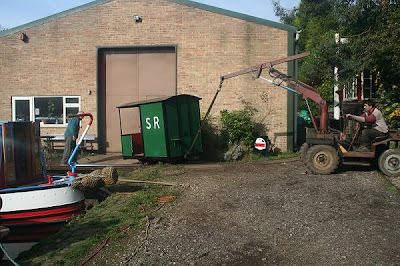 The Brake Van is Rolled Out of the Unit. 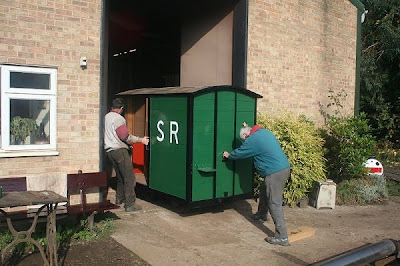 Once the paintwork was completed Keith and Roger wheeled the rebuilt brake van out of the unit to return it to the track. A Little Assistance to Return to the Track. Muscle power alone was not enough to get it back up the slope and onto the track. Once back onto the track a few final touches were done to complete the rebuild. 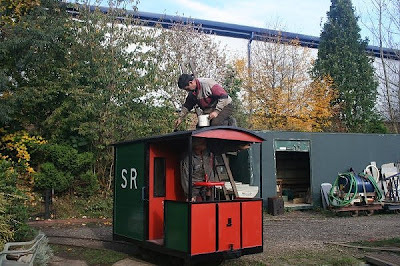 The brake van looks very smart in it's new livery. The Finished Van Joins the Train. All finished the brake van joins the 2 new wagons they rebuilt to form a very smart looking train already for service. Roger then showed Keith how to drive his engine. He enjoyed the opportunity to actually get to drive it. He is looking forward to taking it for a complete circuit once he and Roger have rebuilt the track which has got damaged. 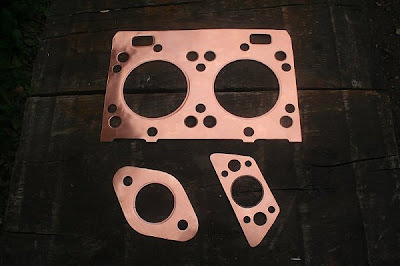 The new gaskets arrived yesterday. This is one set, there is a second set which Keith will keep in a safe place, but hopefully we won't need them. We are just waiting for the liners to be completed, which should be in 2 weeks time. So all is going well with the engine rebuild. My Name is Marmite, and I am Very Pretty. 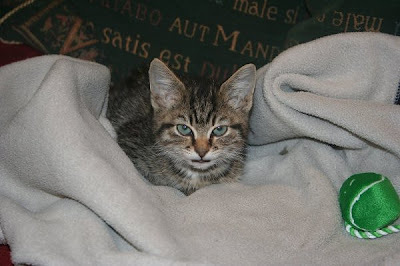 Hello, my name is Marmite and I have found a new home on this boat called Hadar. 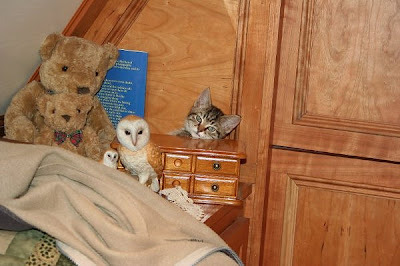 It has 2 large monsters called Keith & Jo that look after me and feed me and play with me. There is a 3rd scary monster called Paddy, I think he wants to eat me! But I make myself bigger and hiss at him, that seems to scare him. 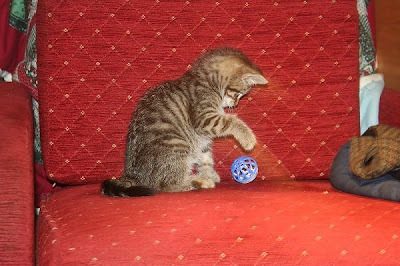 I like to play with my ball and crumpled up paper. I chase them up and down the floor. I pounce on them and kill them. This is a Strange Sort of Mouse. The big monster said something about a mouse in this thing. I can't find it, but I will keep an eye on it. 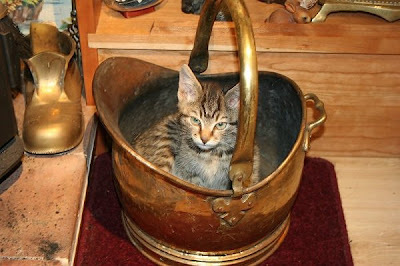 You Can't Really See Me Hiding Here. There are many places to explore and to hide behind. The big monsters keep finding me and picking me up and putting me back on the floor. This is a great game to play. So Much to be Explored in My New Home. One advantage of us still being in Stone is the fact that we got to enjoy the Food and Drinks Festival again this year, we were unable to bring Hadar down to the site, but will be making every effort to bring her down to the festival next year. The high street in Stone was absolutely jam packed with people who were enjoying the Farmers Market which is in Stone on the first Saturday of every month, and very good it is too. There is plenty of choice when it comes to local produce. 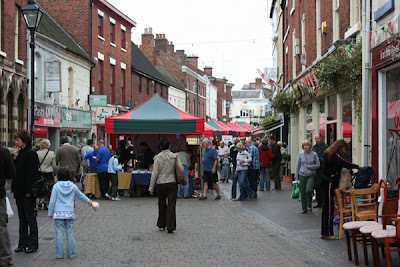 It is probably one of the best Farmers Markets in the country. 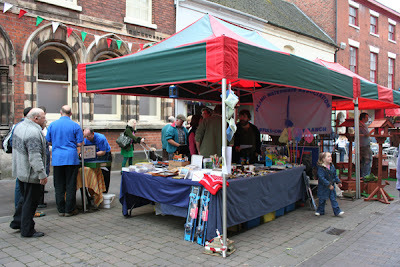 It was nice to see the Stoke-on-Trent IWA stall here again, and the infamous nail game was taking place. For the first time the Gourmet Food Marquee was in Westbridge Park only a couple of minutes stroll from the high street. The marquee housed over 60 stands with exhibitors giving samples and tasters and selling their produce from across the country all under cover, incase the weather should change. Fortunately the weather was very kind to the festival and they had a weekend of excellent weather. 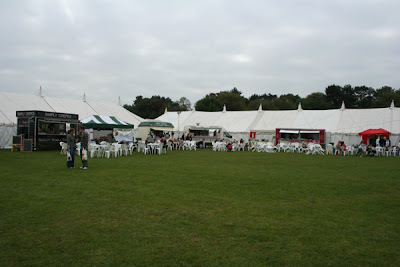 We spent Saturday walking around the marquee enjoying some of the wonderful foods and drinks on offer. Everything from nuts and organic foods to meat and drink. It was a taste sensation and well worth the £2.50 entrance fee. 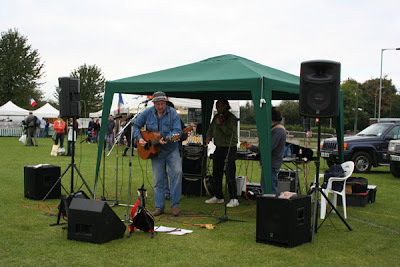 It was wonderful to see so many people turning out for such a well organised event, the organisers did a fantastic job. It must have been a huge amount of work for them all. We know that on the two weeks prior to the event they were having to turn people away who were requesting stalls, as they could not take anymore. As we came through the enterance we were greeted by live music, and many outdoor stalls of French produce. There was also plenty of places to get a coffee and seating for those with tired feet. Inside the Marquee we were spoilt for choice of things to try. We were drawn to the wines and cheeses. 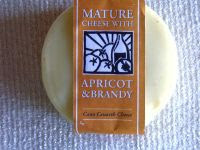 We bought some lovely cheeses from Premier Welsh Hampers, which included Apricot and Brandy mmmmm. Mature cheese with Apricots and Brandy. Ideal with sweet biscuits. In all we bought 3 cheeese from the stall, and will enjoy them with crackers or shortbread. I have never tried Goats cheese before, so this was a good opportunity. 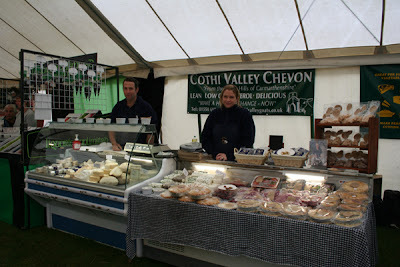 My favourite was goats cheese with chives, and yes you guessed it we bought some. I reckon it will go nice on toast. Cothi Valley Goats, are located in the village of Talley Wales, on Cilwr farm. 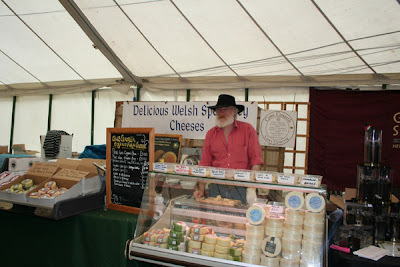 If you have never tried goats milk or cheese, believe me it is well worth a go. So of course once we had our cheese, we needed the wine to go along with it. 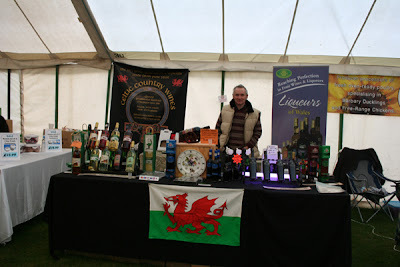 Celtic Wines are made in the Teifi Valley, one of the most picturesque in Wales and the envy of salmon and trout fishermen throughout the Country. We got talking to Keith on the stall and just had to have a taste of a few of the wines, and they were so good that we bought 2 bottles of his finest wines. Elderflower and Apple Wine, Ginger Wine and Mediaeval Mead Wine The oldest alcoholic drink favoured by kings and knights in bygone days, so looks like we will be having our very own private cheese and wine party. We also tried Olives, which I have to say are not for me although Keith did like them. This year there were also three celebrity TV chefs on each day. Mary Berry, Paul Rankin, and James Tanner. I was able to see James Tanner on Sunday as I was asked to take some photographs by the orgrnaiser of the festival for future promotions. Again a very well organised event for ticket holders only. 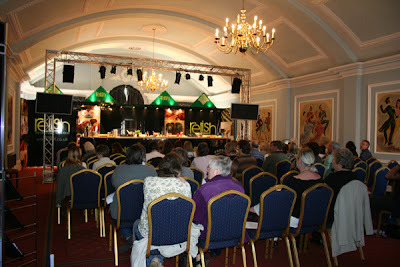 Each chef gave two demonstrations a day in the Trentham Estate sponsored kitchen in the Crown Hotel. 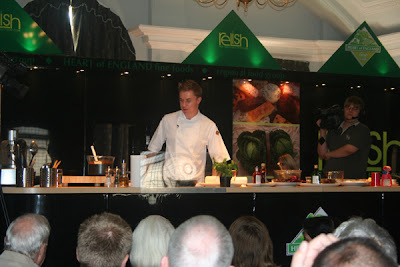 James Tanner was Sundays Chef, he is the youngest chef to appear on Ready Steady Cook, it was a pleasure to stand and watch him entertain the people in the room. James was cooking something splendid with chocolate. I was lucky to actually meet James later in the day in the high street, and I can say he is as nice off the TV as he is on it. If this years festival is anything to go by, next years will be fantastic, so remember to keep the beginning of October free, you will not be disappointed.